Video is never one size fits all. There is a wide range of videos that can suit your need. It is worth exploring what is available, as your business could always benefit from a few different types. If you have a new range of products, a series of product videos showcasing the USPs can be used to get buyers through the checkout, while instructional videos can be used as an after sales service for the same items. Take a look around at what we can offer you. Our videos are created to suit whatever social media channels you are using, whether that’s facebook, twitter, instagram or linkedin. Whatever device your videos are being seen on, your video will be able to cope with them all, giving each viewer the best experience possible. These videos have been all over the internet the last 12 months, they are often 1-2 minute, fun, animated videos to introduce your company and let people know what you do, it is often accompanied with a voice over. These are handy if you need to have several videos made in different languages, as you can have one animated video with unlimited amount of different voice overs. They often require no filming as all the video is animation. You can create one of these videos easily if you are on a budget, there are templates that you can purchase here, then adapt the text, animation and voice over to suit your company. Alternatively, I can create one from scratch, taking in all your requirements and needs. Nothing speaks volumes about your business than testimonials. I can’t remember the last time I purchased something off Amazon without looking at the reviews, and lots of people will be in the same boat when it comes to buying from you. ‘People buy from people’ is one of the things I heard over and over again during the initiation period of all my failed sales jobs, but I think they may be onto something. The toughest part about these videos is getting a few of your customers to take part, many are shy to be in front of the camera and some may just take a bit of persuading. Depending on your business, a short interview with each testimonial-ee and some footage of them using your service could be appropriate. If you are able to get multiple customers on board, we can create 1 video with everybody in, or provide you separate videos for each one to dot around your website as you see fit. Various marketing surveys prove the increasing power of using video for marketing products and services. General promotional videos serve this purpose.These are usually videos to give an overview of a business, using video to paint you in the best light possible. Often bespoke depending on the subject, they can also involve interviews, voice over and graphics. It is often used to give possible customers an idea of what you do, or to show off your facilities. In general, all promotional videos should be high-definition and short (90-120 seconds – three minutes maximum). Our video editor will showcase your company and make sure it is clear what your product is and how it should be used. We can create an explainer video or even an animation video that will talk about you and your business. A product video can be used to show off a product or service in a way that you couldn’t do with pictures alone. See the product in action, while highlighting all of its USPs. A voice over can include extra relevant information, along with information about purchasing. Showing potential customers your product in action will raise confidence in the item and help drive sales. Many companies often have numerous products to show off at one time, so I try and fit as many as possible into a filming, meaning you can have multiple videos for your website, while keeping filming costs to a minimum. These product videos can then be placed all over the internet, getting your product maximum exposure. You can also use your corporate video or company video for promotion on your website, and on social platforms such as Facebook, Instagram or Twitter. 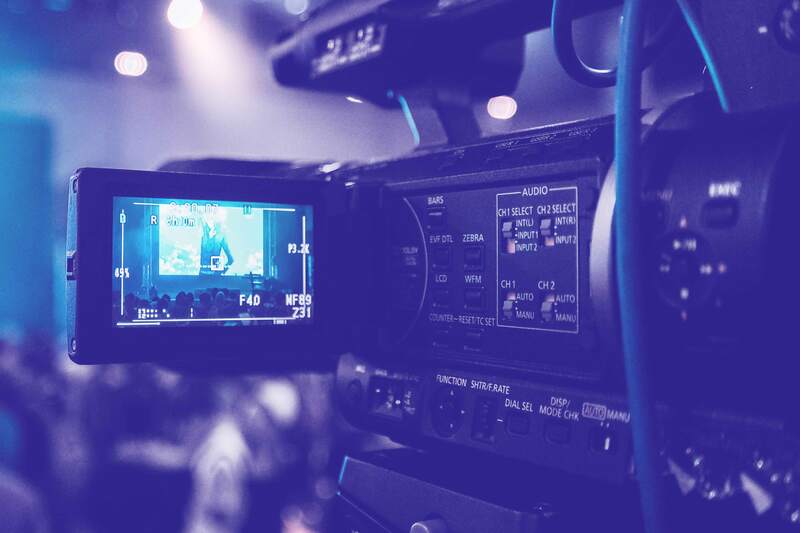 If you’ve got a live event or conference coming up, you may have never thought about having your event broadcast, but there are so many positives from doing so. By broadcasting your conference live, you can benefit from increased revenue from online ticket sales, in addition to selling the sponsorship of the live stream itself. You may be surprised to realise that live streaming an event actually results in increased attendance the following year. All our live streams can be embedded into your website and password protected if needed. We are able to incorporate live video and powerpoint into the stream, so viewers at home never miss any of the action. To find out more about live streaming, you can visit our sister site fullstreamahead.tv for more information. Video can be a great tool for introducing potential clients to your business at trade shows, expos, conferences, and conventions. If you are in charge of running an event each year, a video can help to drum up interest and increase ticket sales. These are often 2-3 minute video montages of the previous event, showing the highlights, with short interviews with organisers/exhibitors/visitors. You can use the video to provide information about the next event. Our filming company usually conducts all necessary filming over 1 day, and various cuts of the video can be used to focus attention on potential visitors or possible exhibitors. Video brings an extra dimension that is more impactful than other media channels. A video production crew should be used for high-profile video production. It is a good idea to create behind-the- scenes time-lapse footage of the event and a set-up to play during the event, which can even be your corporate video. Creating a video which demonstrates the use of a product or service is great as both a sales technique, as well as ensuring you are looking after your customers. Video can make a somewhat complicated task far easier, while it can also help to show a potential buyer all the added benefits of a product before they purchase. Instructional videos can also be fantastic for increasing awareness of your brand, as one of the main search terms on youtube includes the term ‘how to’, so by adding this to the title of your demonstration video, you may be surprised to see the amount of people you get viewing your product and your brand. Apps are quite quickly becoming a must have in the business world, with an ever increasing demand from customers. many people now turn to an app before heading to the web, so having an app that is easy to work and understand is essential. Having a video to explain your app to the public can help with the amount of downloads as well as promote it outside of app stores on social media. If a potential buyer sees your app and can see the benefit, they are much more likely to visit an app store to download.